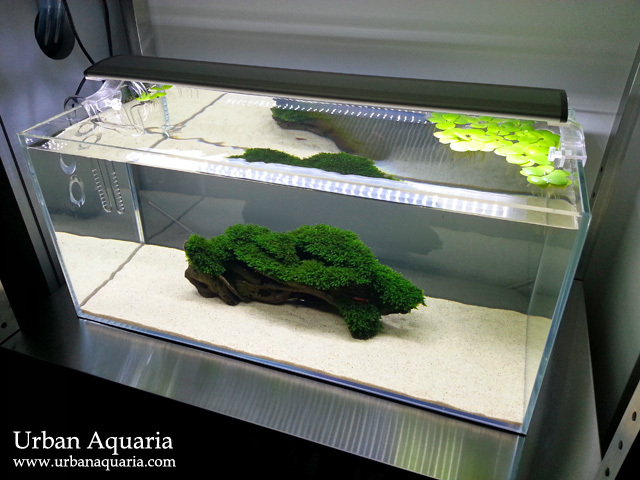 I managed to get around to setting up the 48cm wide / 23 litre tank on the middle shelf of my stainless steel aquarium rack. As i'm keen to try keeping bottom dwelling corydoras fish species (the smaller sized types) in this tank, i decided to use fine sand as the substrate of choice. Btw, i've already tested this sand to be inert and doesn't affect the water parameters (despite its "reef" label), my comparison tests are detailed here. 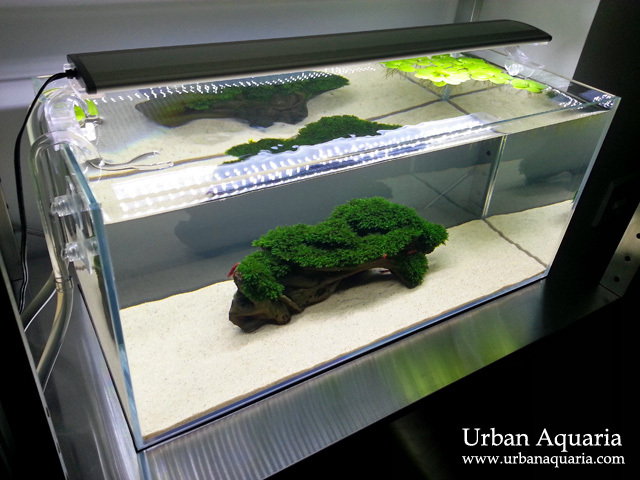 Quite a refreshing change from the dark brown ADA Aqua Soil substrate that i have been looking at over the past few months. As you can see, i transferred the bogwood with fissidens from my 13 litre nano tank (which has since been decommissioned) over to this new tank... it'll be the current hard scape for the moment while i'm thinking about how to scape it further. I also directly transferred over the Eden 501 canister filter too, so it now sits just below the tank on the bottom shelf of the rack. Even though the canister filter holds well established bio media and most of the previous tank's items were carried over, the tank is currently being run initially with just a small group of cherry shrimps for a few more days to ensure and confirm that all the water parameters are stable, before i add in more fauna. 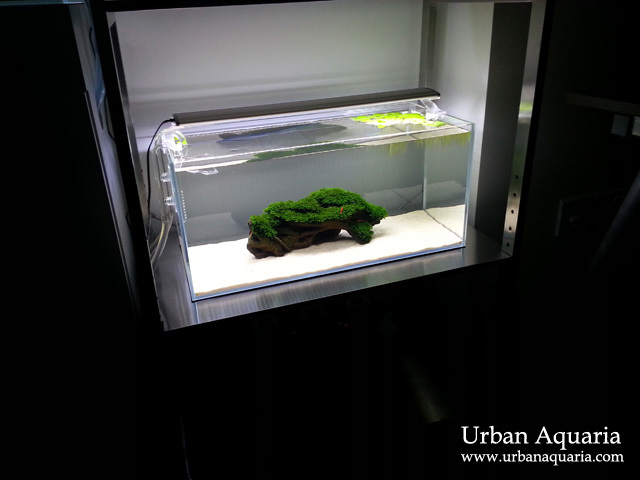 The lights i am using for this tank is the Up Aqua Z-Series Pro LED Z-15 / 45cm version. 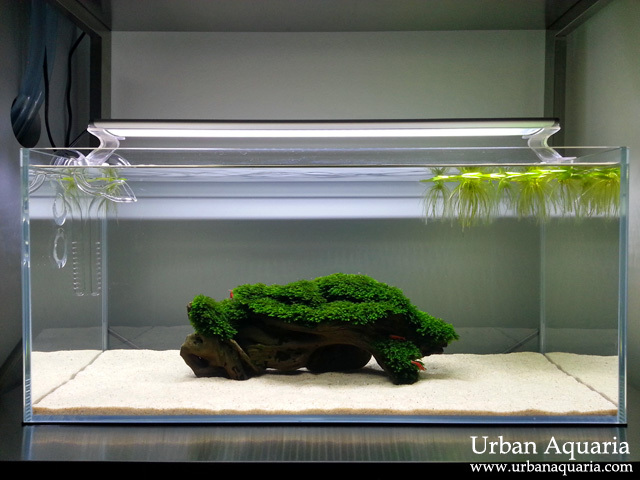 It is still able to fit this 48cm width tank as the plastic holders on the sides can be adjusted abit wider to accommodate the tank's extra 3cm width. This is the first time i'm using sand based substrate and i'm really starting to like the look of it!